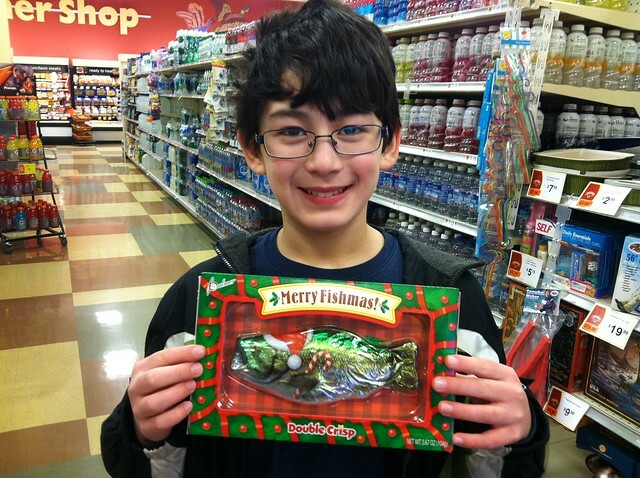 Adam found this Merry Fishmas chocolate last year, but not the Pocket God kind. Everyone in our house, including our fish are having a wonderful holiday season! 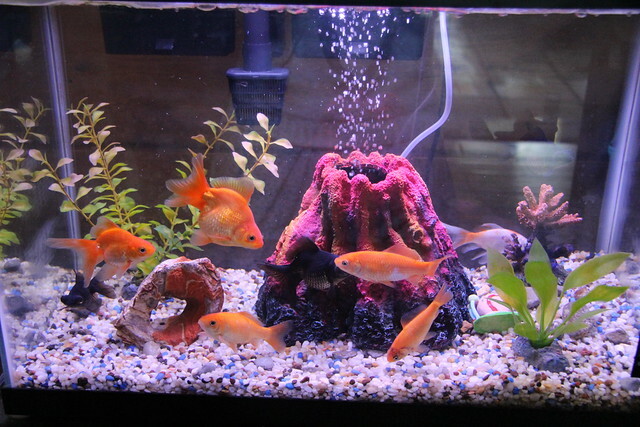 Once upon a time, we had simple 30 gallon aquarium with goldfish. We tried the $8 tropical fish that were all of 1.5 inches long and they died within a few days. So we went for inexpensive feeder goldfish instead, at 27 cents each. Only the finest non-dying fish will do! We eventually settled on four fish which have lasted 6 years now. 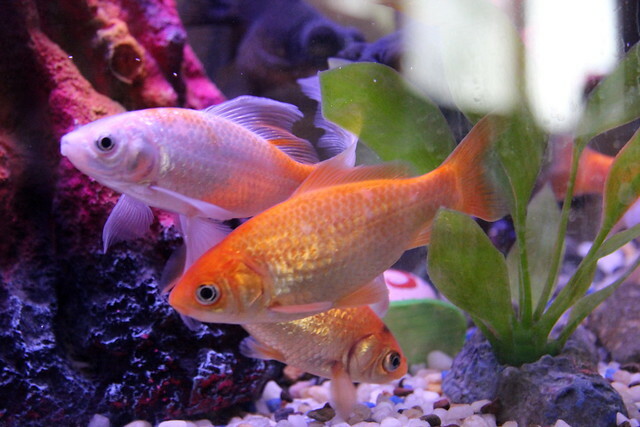 We have white and gold colored fish with long and short tails. It was a happy fish family which cost all of $1.08 (never mind the cost of the oversize aquarium). I cleaned the aquarium every few months (or more) and it was extremely low maintenance. 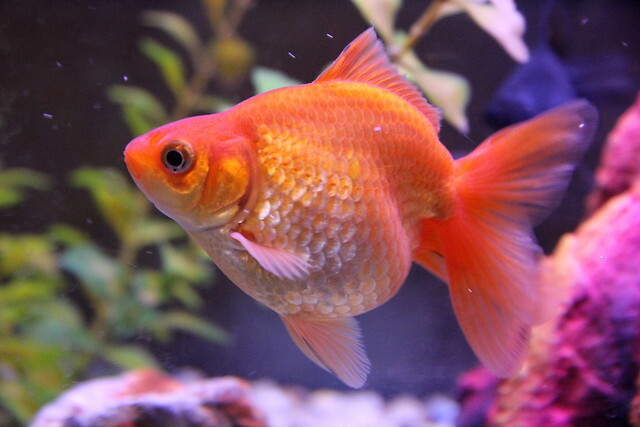 Over the summer, Nicole of Wyoming Girl *turned* Coastie Wife asked the Boston Parent Bloggers group whether anyone would adopt her goldfish since her family was relocating. I guess fish are not high on the list of "pets that travel". Since we had a huge tank for four tiny fish, I gladly offered to take them. Instantly, we had a full aquarium with nine fish. 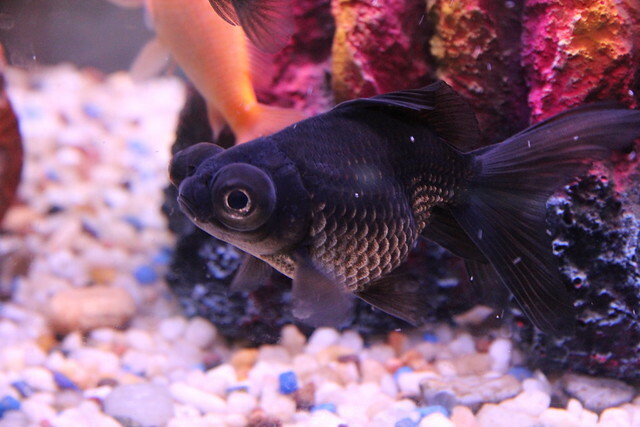 These goldfish were the fancy red fantail and black moor (googly-eyed) variety, which actually cost $8 in the store. Oh my! Can we handle such exotic fish? The first couple months went fine. But I noticed that these new fish pooped A LOT. Of course we feed them more because they were bigger, but the poop problem was getting out of hand. After the first time I cleaned aquarium, it fogged up with algae only three weeks afterward, as if Nemo had stopped by to clog the filter. Finally I broke down and bought a double-sized filter, one for a 30-60 gallon tank, and this wonderful device. I had never heard of a gravel vacuum, but the engineer in me was curious. It took a few tries to get the pump primed (vigorously push the tube up and down in the water a bunch of times until the water jumps over the loop of the tube and starts siphoning). But once it got going, it was a dream come true for finally removing all that poop stuck amidst the gravel. Plumes of poop got sucked up while leaving the gravel clean and white for the first time in years (be thankful I did not video this!). Sure you can get a fancy vacuum with an electric pump, but the good old-fashioned siphon was so cool. Plus I got to teach Dova a bit of fluid mechanics. To her it was like a magic trick. We also purchased a simple air pump and tube for the volcano that had sat dormant for months. I didn't have a diffuser, but Doug improvised by using a fuel filter for a chain saw such as this one. Now we have happy bubbles for our Mount Wannahockaloogie. 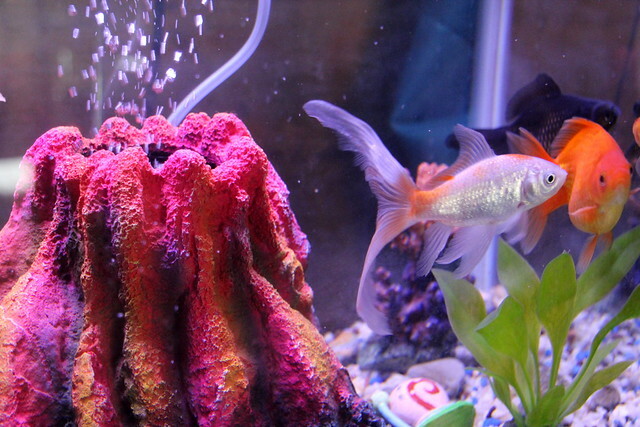 Having a clean aquarium with happy bubbles sure makes for a Merry Fishmas!